It’s 2017 and things are changing. 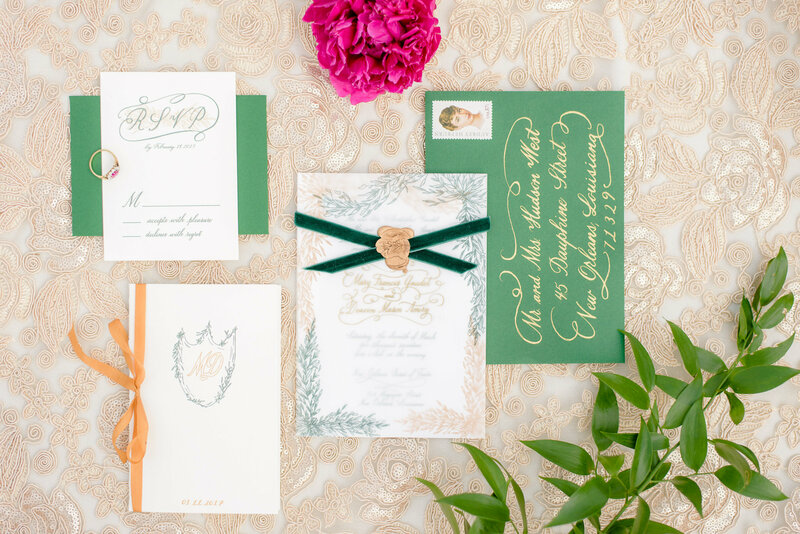 Say goodbye to blush and hello to Pantone’s Color of The Year Greenery! 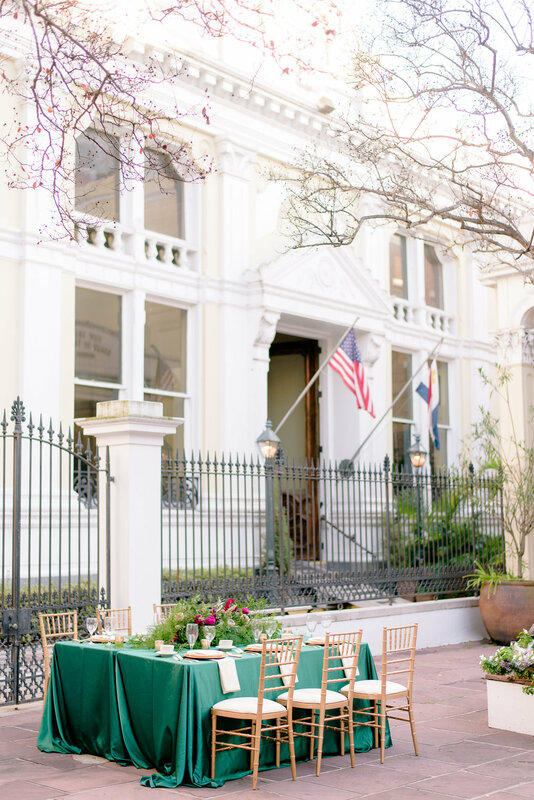 To set this new year off with a bang, we partnered with some other amazing vendors from all over and ventured to New Orleans to put on an amazing Greenery inspired styled shoot. Check out what 2017 has in store! This beautiful cake was created by Cakes by Jan O’Donnell. 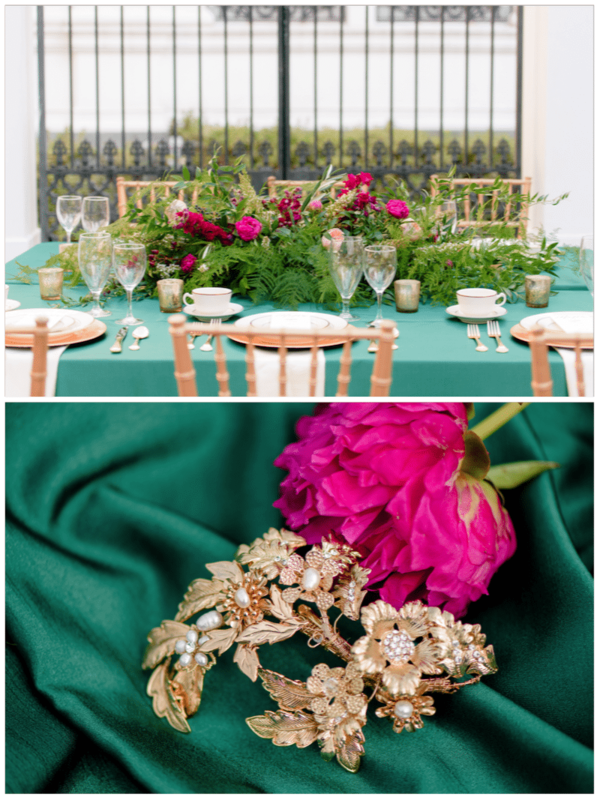 The familiar gold from 2016 is still around but instead of the pale pink and blush colors we’re seeing green come to life! 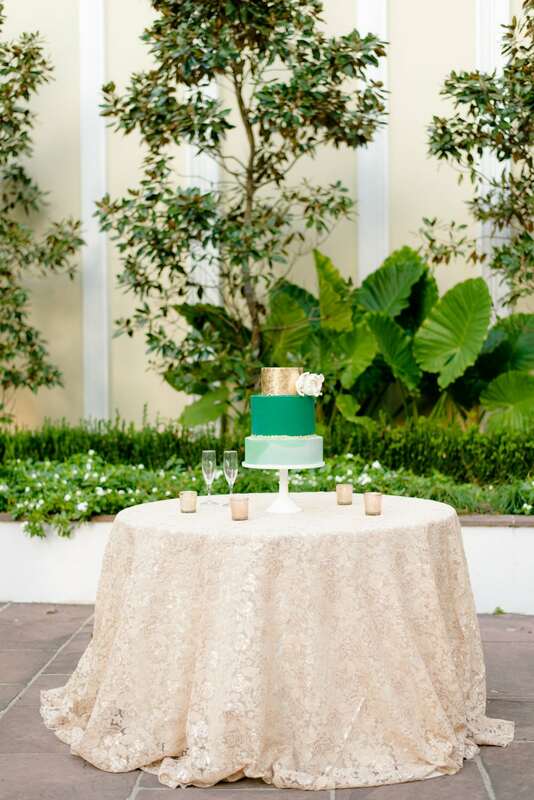 We paired this clean looking cake with our Champagne Florence lace linen with an ivory underlay. 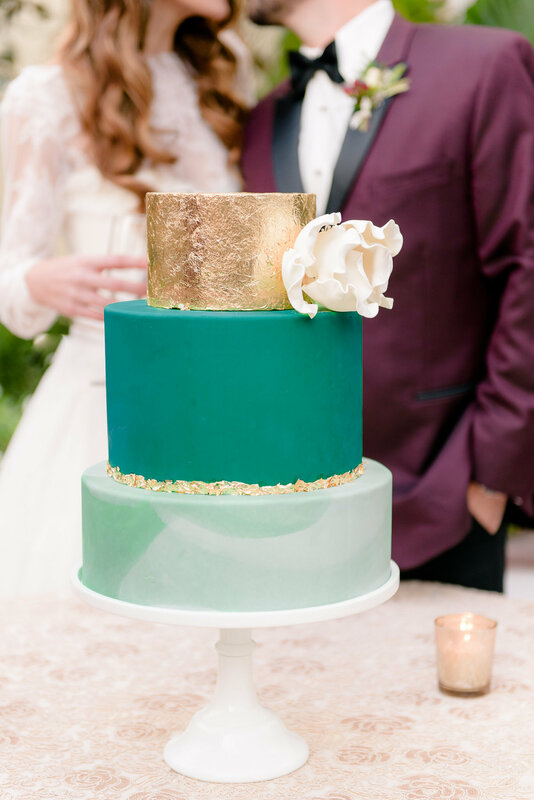 The gold on the cake really helps the champagne pop and they compliment each other perfectly. 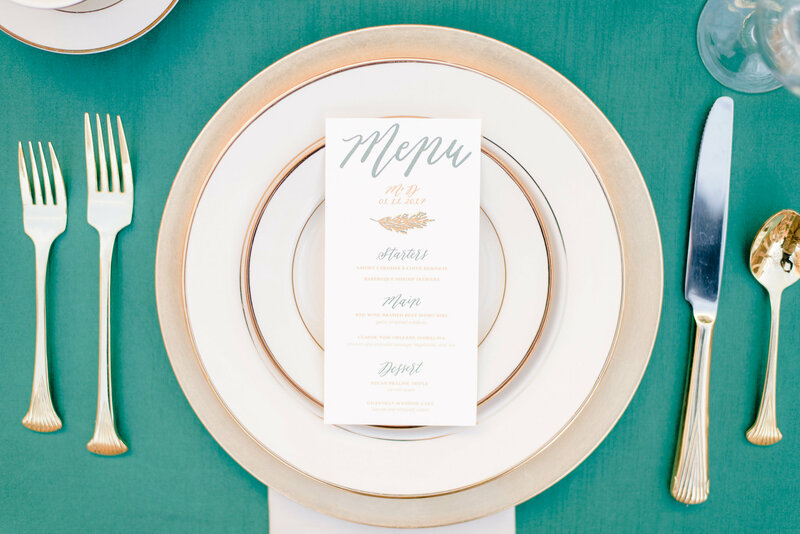 These stationary designs by Made by Meer tie in perfectly to the decor of the rest of the shoot. 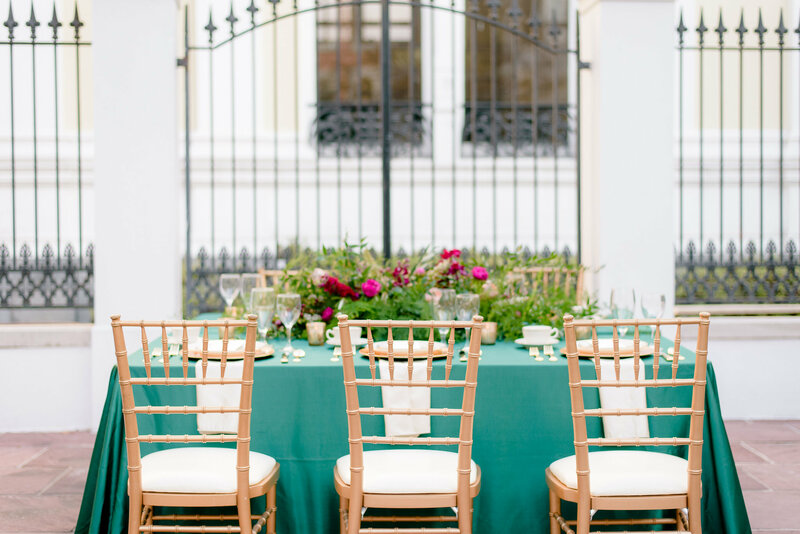 We incorporated a bit of our own green into the shoot with our Hunter Dupioni linen. 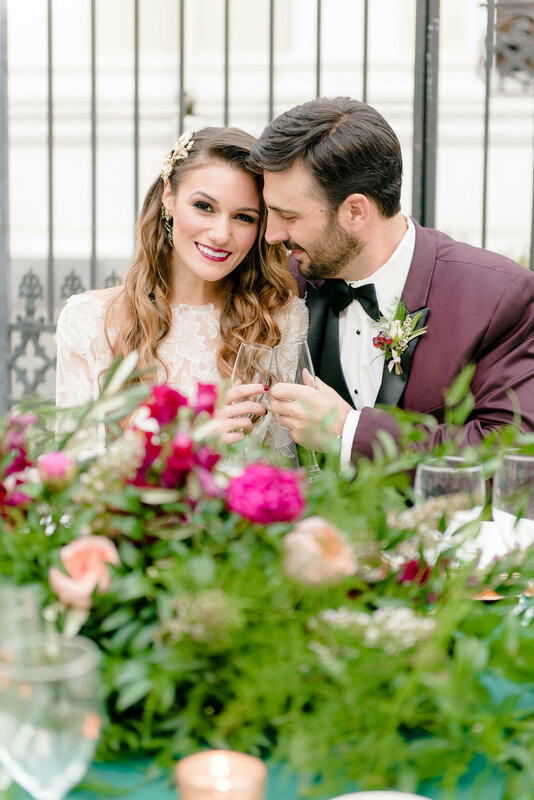 These colors all seem like they were meant to be together thanks to the planning of Becky’s Brides! 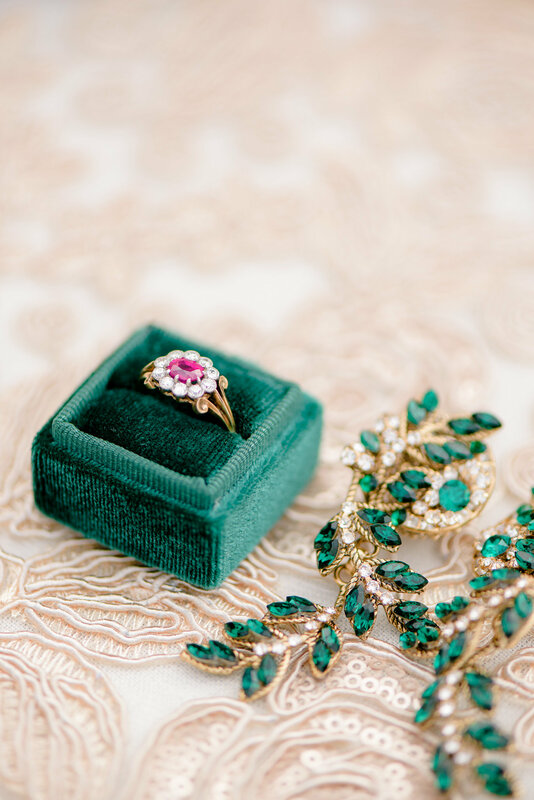 This vintage ring made a unique pop for the shoot courtesy of Trumpet and Horn. Here you also get an un close and personal look at our champagne Florence Lace linen. This linen features pops of sequins without being overly sparkly. The lace allows a pop of color to come through if wanted, but when paired with ivory or white it holds true to it’s champagne look. Up close and personal with our hunter Dupioni linen and we love it! Becky chose to use the matte side of our Dupioni linen and showcase the texture of this table. 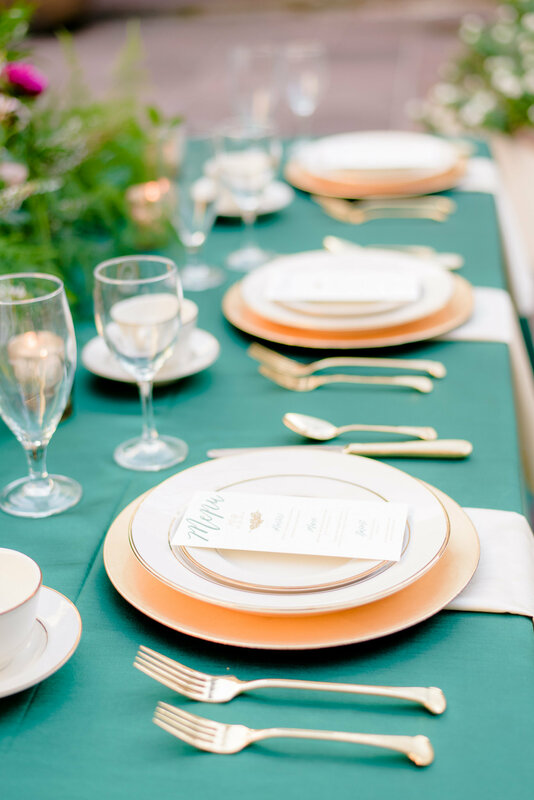 The gold continues to be a staple with the table setting and menu print in this arrangement. This new color combo is something to die for! 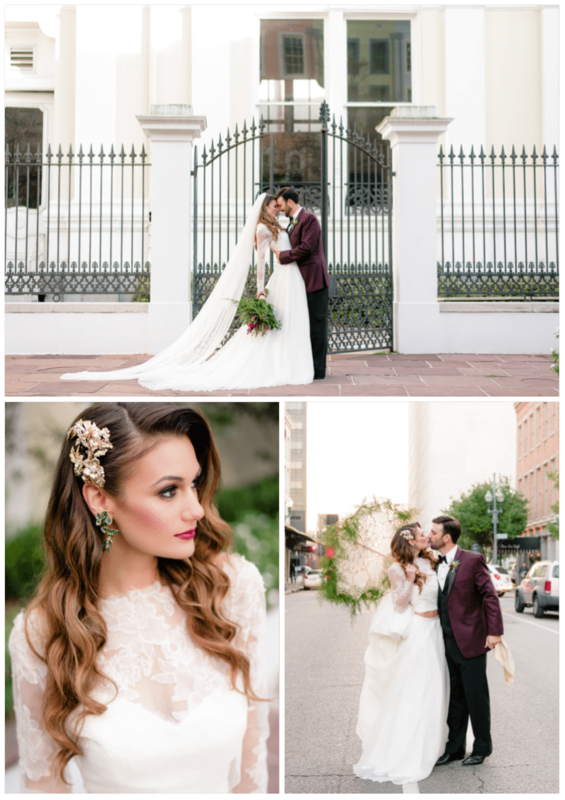 One of our favorite things about this styled shoot is just how perfectly everything paired together. 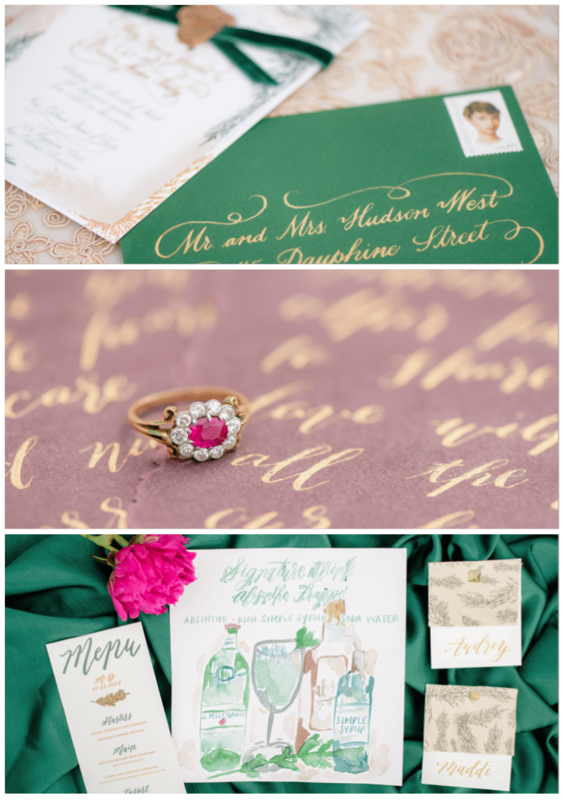 From the invitations, to the flowers, to the jewelry and more, every detail was well thought out and beautiful. 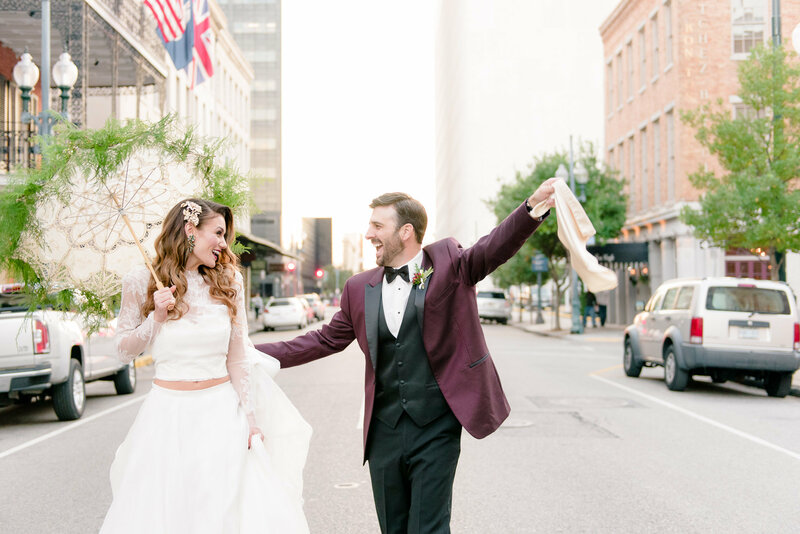 We loved being apart of this shoot and seeing all these amazing vendors work together to create something completely different. 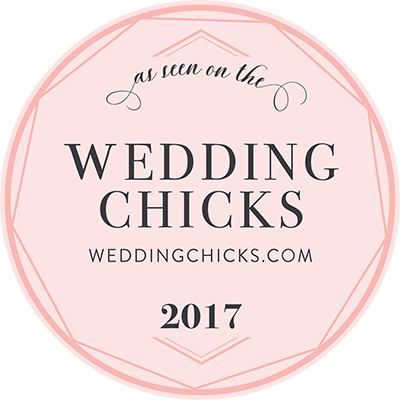 As seen on Wedding Chicks!